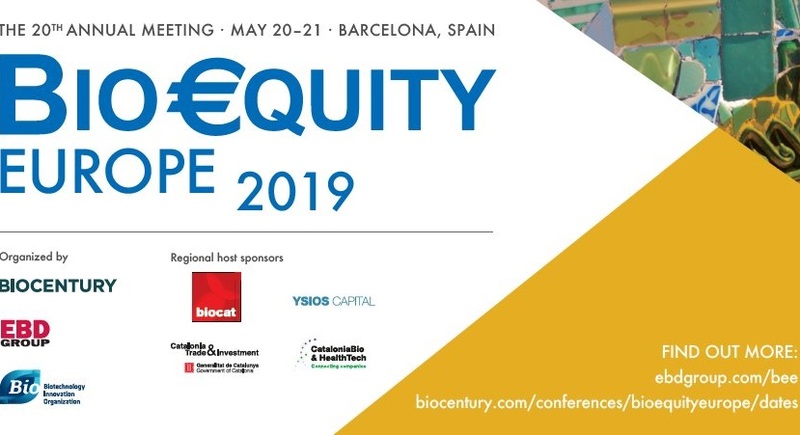 Registration is now open for Bio€quity 2019, the most important biopharmaceutical investor conference in Europe, which will take place in Barcelona for the first time on May 20-21, 2019. Companies that sign up by February 15 get a €200 early bird discount. Plus, members of the BioRegion get an additional permanent discount of €200 off the current rate with code BEE19BIOREGION200. Bio€quity Europe 2019 will be held at Hotel Crowne Plaza Barcelona. Organized by BioCentury and EBD Group, Bio€quity is the seminal industry event for financial dealmakers looking for investor-validated life science companies positioning themselves to attract capital, and for pharmaceutical licensing professionals to assess top prospects. The Regional Host Committee is formed by Biocat, Ysios Capital, ACCIÓ and CataloniaBio & HealthTech. Companies from the BioRegion of Catalonia will feature heavily on the event program, which will be announced shortly. Bio€quity Europe 2019 receives ample support from companies and organizations in the BioRegion, as well as international investment funds and consultants looking to establish themselves in the city of Barcelona: Caixa Capital Risc and Grifols as Regional Platinum Sponsors and Alira Health, ASEBIO, Asabys Partners, GP Pharm, HealthEquity, KPMG, Locust Walk and WEcubed Partners as Regional Gold Sponsors. Throughout its history, Bio€quity Europe has showcased more than 800 leading European companies to thousands of investment and pharma business development professionals. More than 550 delegates from 26 nations attended Bio€quity Europe in Ghent in 2018.